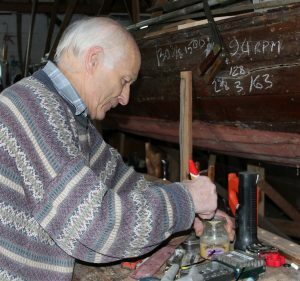 Paul has spent most of his working life working on the Broads, building and fitting out boats, including working on world speed record holding boats. 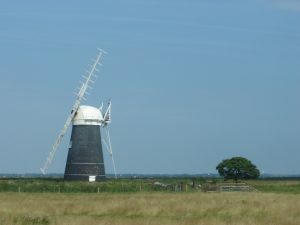 He has also had a long interest in the restoration for the mills of the Broads, which led to him owning a local mill and helping restore and repair several others. I was brought up in Norwich and after I left school in 1953 I went to Dawnay’s Limited in Norwich as an apprentice in the drawing office, and day release City College to study for a National Certificate in Mechanical Engineering. Before I left school I had become interested in boat building, doing canoeing and sailing so, I decided to leave Dawnay’s, get rid of my National Service and then get into boat building. I was in the RAF, stationed in Stafford, whilst I was there they started a sailing club, which I got involved with. I also joined the mountain rescue team, which I enjoyed, but I didn’t save anyone though. When I left I got a job as an improver boat builder with Norfolk Holiday Boats in Horning, I was there for about four and a half years, during which time two of us built a new Horning ferry, followed by another two. I also built a small dinghy at home in my shed. These boats were wooden boats, but at that time, things were changing and fibreglass was just coming in. I worked at what was Banham’s yard and after the Horning ferry no boats were built there, fibreglass hulls were being bought in, to fit into the hire fleet. In 1965 I went to work for Tim Whelpton at his boatyard in Upton, they had a small hire fleet of about a dozen, all wooden boats. I was involved in building one boat as soon as I started, but then they also went into fibreglass so after that I was just fitting-out fibreglass hulls. A few years later, probably 1970, we did build a private boat, a nice little 21 foot wooden yacht, but then after that we carried on expanding the hire fleet with fibreglass hulls and eventually fibreglass top molds as well. To begin with at Upton it was quite interesting work, as you did everything there, fitted engines, appliances, all sorts, whereas at Horning you’d gone straight on woodwork. They were all sailing boats at Upton which was a plus for me, most of the boats I worked on were for inland use. After a while they were buying in boats at Upton, rather than finishing them themselves, so it got a bit boring, we were just updating the hire fleet. In 1974 we got involved with Crossbow, which is Tim Colman’s speed machine, for the world speed sailing record, which was established in 1972. Crossbow’s record was 23 knots, and was built by Reg White in Brightlingsea. Tim Colman wanted a new hull built, we did the work at Upton and upped the record to 29 knots, later on there was Crossbow 2 which we also worked on at Upton. This was a fast machine designed by Rod Macalpine-Downie, a clever man, the hulls were built elsewhere but we finished it off. The speed attempts took place in Portland Harbour at Weymouth. Crossbow 2 eventually reached a speed of 36 knots, and that record stood for some six years. These were big boats 60-65 foot, and the record was beaten by a sailboard which was quite the opposite in size, a one man boat, tiny thing. There was to be a Crossbow 3 which was started but never finished because the designer unfortunately died. The introduction of the Recreational Craft Directive (RCD) in 1998 effectively meant because of the all the regulations involved no more new boats were being built at Upton. 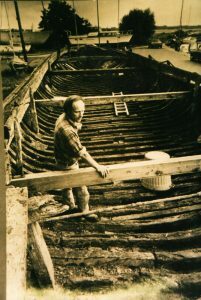 The yard had the chance to build a wooden boat, a half decker, for a local lady, but they didn’t want to take it on, so that’s when I decided to go self employed, and building that boat was one of my first jobs. I started this in 2000, in my workshop at home, which I had built in 1975, and already had my own boat in, which needed work doing on it. In between doing the work on the half decker and my own boat, I had an emergency job on Oby Mill, which was in danger of dropping bits and pieces on boats and people walking below. This wasn’t my first job on a mill, I had already bought Mutton’s Mill in 1975 with David High. I had always thought when I first started boating around the Broads, that I ought to save one of these mills, Some of them like Stracey, Horsey and Thurne mills were being saved, but a lot of them were just left derelict. The mill was built I believe by 1837, and was named after generations of Muttons who were local marshmen. I went up to Thurne St Benet’s mill one day after rescuing what was to become my crab boat, from a dyke ,and I was talking to two millwrights who were working on several mills; one, Phillip Lennard found out that Mutton’s Mill was coming up for sale. We went to have a look at it before it was advertised and my friend David High and I bought it from the farmer. I had several boats at this time, so I sold my crab boat and a half decker and managed to scrape enough together for my half share. I also had a 30 foot sail cruiser which I couldn’t sell as it wasn’t in a condition to sail, I might get it finished one day. The mill was fairly derelict, but it had all the bits and pieces there, it was last used in working order during the war. I’m not sure that it was actually used because the pumps would have been diesel operated, I don’t think that there were any electric ones then. It was in good order after the war but then it deteriorated as it was no longer required. We took the sails off and repaired enough for a pair, took the stocks off thinking that one might go back, but we found that it wasn’t good enough, but we managed to slice a piece off Berney Arms, as when they replaced theirs they had discarded old stocks. It took a few years to gather enough wood to make a new cap frame, using some of the old timbers. We built that and a whole cap actually in the workshop, which had I had just built. During this time we got help from Mr Raynor, a Windmills Trust man from County Hall and then from Steve Earl also at County Hall. During this time we got several grants to help with the work. At the rate we worked we didn’t need a great deal of money all in one go. We worked through our holidays, sometimes if we had a big job, for example putting the cap frame back on or getting the sails back on, it was handy to have several days in a row working on it. We never really felt that we had taken on too much, although we did get to the stage probably about ten years ago or more, where we were finding that we had to go back to do things again which we had done earlier, where maybe rot had set in or there had been storm damage. One example is when we had got the sails, stocks and everything on the top sails on, we started getting cracks appearing in the tower walls. We put bands around it to hold it together, the mill was built on a timber raft and there was not much holding the two halves together. We discovered that the wood underneath the mill foundations was rotten. Whether the work on the mill will ever get finished depends on the Broads Authority and the Lottery grant. I would like to continue and get it finished, but I am not able to do as much heavy work as I used to. The Lottery money might be available in 2018, by which time I will be 80, so I don’t think that I am going to be capable of doing too much, I am finding it hard going now. Muttons Mill.2006. Photo: Ian Martin. I got to know the owner of Oby Mill at the yard at Upton as he had a launch there that he was working on, to enable him to get to the mill from Upton, the access wasn’t good from the land. I gave him a hand making the mill safe to start with, taking all the cap frame off, stocks out. We just left the windshaft up there and fitted a temporary cap. After I finished the work, the owner wanted me to do some more restoration work, but he eventually had to sell the property. The present owners approached a retired millwright from Essex, Vince Pargeter. He became involved with the mill and as he was keen on getting Oby Mill restored he put in a very low price. He did get started on the work but unfortunately he died a year or so ago and no one else has been able to take on the work. The mill built in 1753 is Grade 2* listed so English Heritage, the Environment Agency and Broads Authority are involved so what’s going to happen now I don’t know. 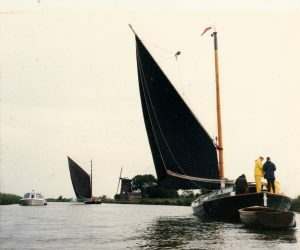 The Wherry Maud – Paul worked on the mast. Oby Mill in the background. The Wherry Albion midstream. 1999. Photo: Roger Watts. I also helped do work on Clippesby Mill, taking the stocks off it as they were swinging around and we were afraid that they could have fallen and injured someone. As well as Oby, Clippesby, and Upton, David High and I gave Richard Seago a hand to recover the mill at Acle, a little hollow post mill, which drained a small marsh where the fire service horses were kept in the meadow. It was set up at the boatyard in Upton, and is still turning today. We also helped Richard moving one which has been set up and restored at How Hill. There is quite a lot of public interest in the mills, the ones that you can get to, some are not so easy to reach. There is a footpath running past Oby Mill and Clippesby Mill, and there is also a footpath running near Mutton’s Mill. Quite a few people walk down to Berney Arms, but they turn off a couple of hundred yards before Mutton’s Mill, we sometimes get the odd visitor who has lost his way. I don’t know of anyone who could take on the work needed to be done. There is a shortage of millwrights and quite a few times you have seen people take on mills, only to run out of money or enthusiasm, or whatever, as happened with Oby Mill. Years ago the Windmills Trust funded two mills, Ashtree Farm Mill and High’s Mill at Halvergate marshes. They funded the piling programme for those and used two different methods, I think to see which was the most successful, so that’s really for the long term. I think that the future of the mills on the marshes is looking quite promising at the moment, if this grant comes through. The Broads Authority is surveying quite a number of the mills and will eventually select a certain number to either restore completely, or by doing minor repairs on them, preserve, them as they are. The future looks encouraging for now but the long term future of the mills, I think, is uncertain. Paul in his workshop at home. He still builds boats there. Photo MM Feb 2017.